CES 2012: Pure unveils its first AirPlay dock, plus revamped Sensia radio | What Hi-Fi? 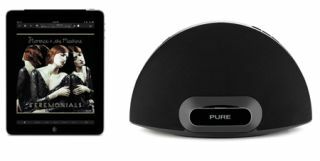 Pure is unveiling its first AirPlay-enabled product here at CES 2012, in the shape of the £200 Pure Contour 200i Air. At the same time, it has taken the wraps of the MkII version of its Sensia DAB/internet radio, the £250 Sensia 200D Connect. Let's take a look at the Contour 200i Air first. It looks just like the existing Contour 200 dock, but this time there's no DAB or FM radio installed. Instead, it's AirPlay enabled so you can stream music wirelessly from your Mac, PC or Apple iDevice and connect it directly to your network via ethernet or wi-fi. So why no radio? Well put simply, Pure says the unit is designed to work with the free Pure Lounge app which gives access to tens of thousands of internet radio stations and on-demand content, incuding the Pure Music subscription service. So a conventional DAB/FM radio is redundant. The Contour 200i Air will charge your iPhone, iPod or iPad when it's docked, is fully 'works with' compliant with Apple portables and when your Apple iDevice is docked it can be controlled using the supplied remote control. You can also connect the dock to a home AV system using the coaxial digital audio output, and there's an aux in for connecting other MP3 players. Power output is 2 x 18W. Software updates can be delivered over the air via wi-fi. We'll be receiving our review sample of the Pure Contour 200i Air at the end of this month. The other big news from Pure is the release of its revised and upgraded Sensia 200D Connect radio. While it may look very similar to the existing Sensia, there have been some major revisions. The sometimes hesitant touchscreen interface of the original has been improved, and some basic control buttons (on/off/mute) have been added to the top of the unit for ease of use. You can now record digital or internet radio to a USB memory stick, recordings can be timed or instant, and they can be played back on other Pure products such as the Sirocco 550 or Highway 300Di in-car DAB system. Audio performance has been enhanced, says Pure, with DSP tuning of the Class D amplifiers delivering "improved stereo separation and immersive, room-filling sound". As with all Pure's connected products, you can stream music from your computer, the Pure Lounge app and Pure Music subscription service. Web connectivity brings access to Facebook, Twitter, Picasa, weather and an RSS reader. And you can use the Sensia as a digital photo frame, either by sreaming pictures across your local network from your PC/Mac, NAS drive or via the embedded Picasa app. Power outputis 2 x 25W, there are bass and treble controls, two alarms, 40 radio presets, an aux input, eadphone out and remote control. The Pure Sensia 200D Connect will go on sale for £250 in the second quarter of 2012.